Ron Roenicke has a 253-233 record in three seasons as Brewers manager. 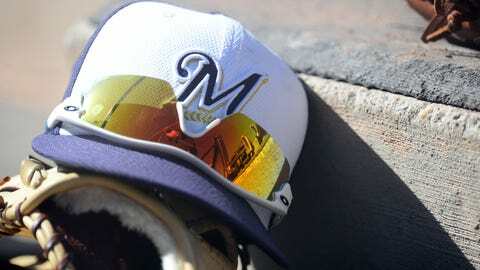 The Milwaukee Brewers have exercised the club option for 2015 on manager Ron Roenicke and added a club option for 2016, allowing the skipper to enter this season with security past this year. 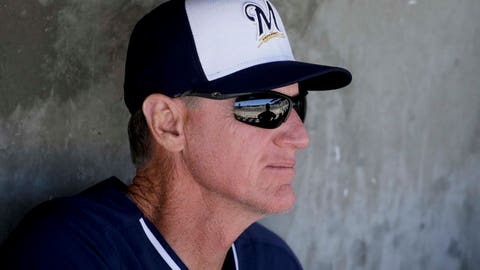 Roenicke is 253-233 in three seasons as manager of the Brewers, including leading the team to a franchise-record 96 wins, the National League Central division crown and a berth in the National League Championship Series in 2011. The Brewers finished 83-79 in Roenicke’s second year as skipper and battled injuries and suspension to a disappointing 74-88 finish in 2013. "In picking up the option for 2015, it shows our confidence in having Ron lead this team on the field," Brewers general manager Doug Melvin said. "Last season was a difficult one, and Ron provided critical leadership with confidence and assurance that the Brewers can get back to the postseason." Hired as the franchise’s 18th manager in November of 2010, the 57-year-old signed a contract extension following the 2012 season that ran through 2014 with a club option for 2015. It would have been a difficult situation for Roenicke to have the contract situation lingering over him. "It’s nice," said Roenicke of having the 2015 option picked up. "It just makes you feel like the club is behind you. I feel that way, but sometimes just doing this helps." The players, who have wholeheartedly supported the skipper, greeted Roenicke and celebrated the news with him when he came into the clubhouse at Maryvale Baseball Park on Saturday morning. Roenicke said eliminating some of the questions about the manager can help ease the mind of the players as well. "A lot of times you are doing things for the future and you aren’t sure you are a part of the future," Roenicke said. "My job is to try to win as many ballgames as I can. Sometimes if you are rebuilding it gets difficult." Roenicke is fourth among Brewers managers that have guided the team for at least one full season in winning percentage and already sixth in wins. He’ll pass Del Crandall for fifth in wins as a Milwaukee manager early in 2014. He’s only the third manager in team history to post winning records in consecutive seasons, as George Bamberger did it in 1978-79 and Tom Trebelhorn in 1987-88. Roenicke finished second to Kirk Gibson in the 2011 National League Manager of the Year voting. Roenicke came to the Brewers after 11 seasons on Mike Scioscia’s staff with the Angels. He was the team’s third-base coach from 2000-05 and bench coach from 2006-10. Settling the top: It appears as if the Brewers have settled on their leadoff hitter for the time being, as Carlos Gomez found himself at the top of the order again Saturday. He led off the bottom of the first inning with a home run off Angels right-hander Joe Blanton, showing why Roenicke likes the center fielder in that position. "I’m liking what I see so far," Roenicke said. "If we see that it’s working well, we’re going to go with it." That would give the Brewers a top five in the lineup of Gomez, Jean Segura, Ryan Braun, Aramis Ramirez and Jonathan Lucroy. Roenicke said he’d settle the bottom of the order based on who else is playing on that given day.